We came face to face with a bull elephant at 10 feet, on foot. Our guide, unique in Africa, trusted us. We trusted the elephant. And, more importantly, the elephant trusted us. Then our guide went through the bush and gingerly plucked six hairs from a bull’s tail and ran back to us with a gift unlike any other. It was a playful antic the bushmen have been enacting for more than 50,000 years. 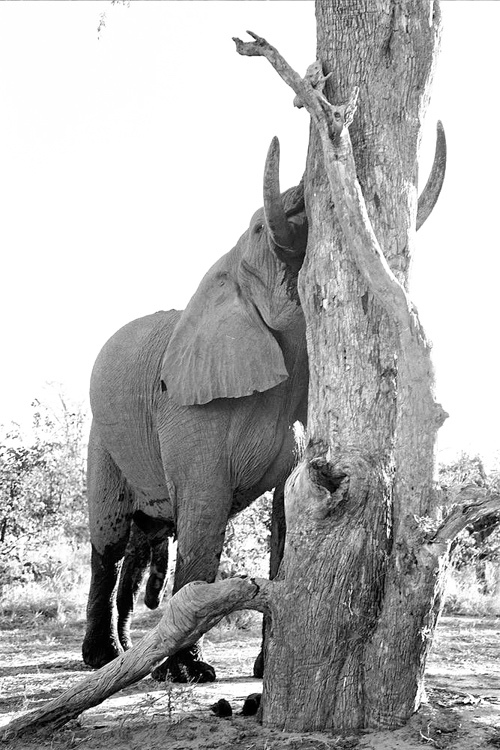 It is a gesture, but as playful as any on Earth, that honors the elephant’s great stature. Humanity must come together so that poaching dies the death it deserves. China may close its ivory markets this year, but now mammoth tusks are being sought in Siberia and laying siege to the land. The elephant is still imperiled. And so is the lion, the beings under one year, still cubs, that our guide allowed us to greet on our stomachs from 20 feet away. Our moments were not provocations but acts of fellowship. But now that we know that the elephant, rhino, lion, tiger and polar bear, the entire natural order, are up for grabs, humanity must act. The poaching and trophy hunting led by men who eat a lot of dead meat are the culprits. And the meat industry is second to the coal and gas industries for carbon emissions and creating dead zones. Almost all the harm is being done by men, not coincidentally. Women give life. It seems men take it away. After returning from Africa, Lysander, our son, exclaimed that he had two selves. An older, primal self in Africa and his other self, distracted by a digital, militaristic, consumeristic nightmare that is freaking out the carbon balance of the planet. A 2-million-year-old consciousness touched Swiss psychiatrist and psychoanalyst Carl Jung and transformed his life and thinking. All thanks to Africa. It is what moved Lysander when he watched an elephant walk by him on foot. But such lessons come from every corner of the organic world. What will be left of it by 2100? The mechanistic, synthetic and cybernetic world is taking away the very soul that grounds us. The healing and bridging of those two selves will be hard, but it is the challenge, ecologically and spiritually, of this time. Those with the voice and finances and those who have any thought of their children should invest heavily in protecting the world’s last ecosystems, and by extension its Native people who abide by a greater law than Wall Street’s. The fixation in growth and gross domestic product will not bring the rain and stop typhoons. The world of Blade Runner is around the corner. Wake up or children will have nothing to look forward to. Not elephants, not slugs, not anything. For those parents who say this may be a concern of yours, but it isn’t ours. Right. Beware of those parents. After Hurricanes Irma and Harvey, there has never been a better time to wake up.